To be a black woman of faith in the American South is to understand and experience spirituality in a particular way. 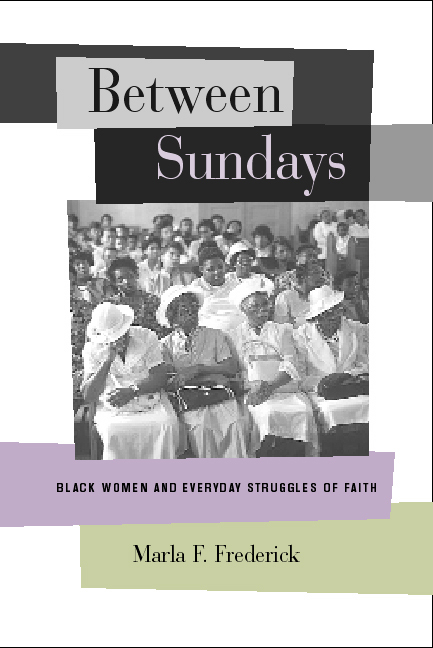 How this understanding expresses itself in everyday practices of faith is the subject of Between Sundays, an innovative work that takes readers beyond common misconceptions and narrow assumptions about black religion and into the actual complexities of African American women's spiritual lives. Gracefully combining narrative, interviews, and analysis, this book explores the personal, political, and spiritual commitments of a group of Baptist women whose experiences have been informed by the realities of life in a rural, southern community. In these lives, "spirituality" emerges as a space for creative agency, of vital importance to the ways in which these women interpret, inform, and reshape their social conditions--conditions often characterized by limited access to job opportunities, health care, and equitable schooling. In the words of these women, and in Marla F. Frederick's deft analysis, we see how spirituality—expressed as gratitude, empathy, or righteous discontent—operates as a transformative power in women's interactions with others, and in their own more intimate renegotiations of self. Marla F. Frederick is Assistant Professor of Religion and African American Studies at Harvard University. Monday "Of the Meaning of Progress"
Revival: "Are We a Church or a Social Change Organization?"